Berlin is one of the coolest cities in the world, hands down. I’ve been living in Berlin for the past four years, on and off. So I’m biased, yes, but once you come here and experience it for yourself, you’ll surely also come to love the endless layers to this city – the fascinating history, the underbelly, the artistic vibes, and the cosmopolitan nature of it. Berlin is affordable, gritty, incredibly green, and it seems that no-matter what kind of person you identify yourself as, you can find your tribe here. Though this is firmly on the tourist trail, you can’t come to Berlin and not see the wall! This still-standing part of the Berlin wall that divided the city has been painted over by talented muralists and is completely free to walk along and gaze at, while trying to figure out what the artists were trying to convey. How many cities have an old repurposed airport where you can go fly a kite, barbecue on, and wind surf on the old tarmac? This is a fairly local experience, especially in the summer when you’ll see Berliners sunning themselves in the grass and having drinks together as the sun goes down. The old airport is still intact as well, keep reading below to see how you can get inside! The Parliament Building’s dome is Such a cool way to see the city day or night. This is another touristy thing that is totally worth it. The parliament building’s glass dome gives you a beautiful panoramic view of the city and it’s open at night too. 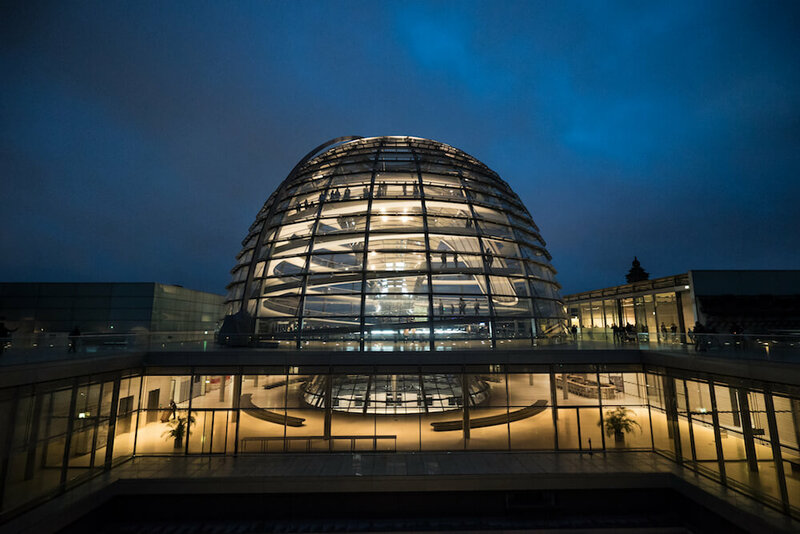 The walking platform circles around the glass dome while you listen to an audio taping in your preferred language and learn about various landmarks of the city – and it’s all free! I advise getting there for the sunset and watching as the city lights come on. 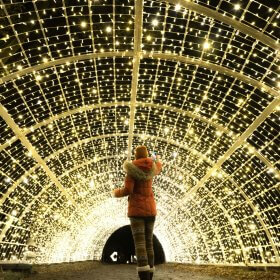 Register here first.You’ll need to submit three times online, well ahead of time, that you are available to visit the dome, so plan this one into your schedule because it can get busy, especially in the summer months. The Sunday Mauerpark flea market can be fun to visit, though in my opinion it’s overpriced. The best part about it is the open air karaoke that is free to attend and invites anyone in the crowd to come sing. It’s a surprisingly supportive crowd so if you’re itching to do it, give it a try! This is a pretty local thing to do in the Kreuzberg neighborhood and somewhere you’re likely to see me at sunset in the summertime. Most people grab a drink and sit on the grass, maybe playing cards or guitar, and enjoy the sun with their friends while watching the swans swim by on the canal. This rooftop bar has a three euro entry fee but when the weather is fine, it’s totally worth it. It’s got funky decor, live music most days, and on the deck outside there are plants, a rotation of quirky art pieces, and even a sandbox. I have spent many a summer day-turned-evening watching the sunset from this spot. To get there, take an elevator up to the top floor of the parking garage at the Neukölln Arcaden and as you come out of the elevator, bear left and you will start to see the ramp leading up to the bar. I couldn’t believe a Thai street food market existed in Germany until going there myself. If you want to have authentic, street-style Thai food, head to Thai Park in Charlottenburg on a weekend day when the weather is nice and you will see scores of people sitting on the ground serving up everything from Thai iced tea to pad see ew. Most dishes cost a standard five euros, so it’s pretty authentic except for the price! Still, not bad for Europe. Note: There’s uncertainty at the moment about whether the park can continue due to lack of licensing. Stay updated here. European flea markets have so many cool old treasures! And the ones in Berlin, in particular, are delightfully quirky. I love the ones at Urban Spree and Boxhagenerpltaz in Friedrichshain where I have found everything from a globe of the moon to candelabras to hang on my wall. You can find old books, records, genuine (used) fur coats for dirt cheap, and jewelry as well. This floating swimming pool on the river is a fun summertime activity and while touristy, it’s one of those things that is worth it anyways, and full of good looking people! Even if you don’t have a swimsuit, you can pop by the bar for a drink. I’m usually not a big fan of city tours, but I have done a couple of Alternative Berlin’s street art walking tours and I absolutely love them. You get the combo of history and counter culture, plus they tend to attract some interesting tourists worth getting to know, especially if you’re traveling solo. Naked coed spas are a truly Berlin experience! Though this is not the only one in the city, it’s definitely the classiest and the best value for your money. You can pay extra for a massage, or just enjoy alternating between the pools of different temperatures in the saunas. My personal favorite is to go into the 95°C sauna and then jump right into the coolest pool right after and continue alternating. FYI, Vabali is a clothing-free joint and everyone is completely naked with no separation based on gender. I was a bit apprehensive when I first went that people might stare at me, but it’s actually really nice to be in an environment where everyone is naked and it is not sexualized. It was refreshing to see how little it mattered that we were all in our birthday suits. It’s one of my favorite cold-weather activities now! On Mondays and Wednesdays there are English tours of the inside of the Templehof airport. It feels completely frozen in time with almost everything left exactly as it was. You’re also completely free to walk behind the counters, sit on the conveyor belts, and wander through history while listening to a guide to describe the Berlin airlift and what each room was used for previously. I think it’s a pretty unique experience, and a great way to pass a rainy day in Berlin. Of which there are many. The list is almost endless of museums to check out in Berlin. As an art buff, I tend to take to the streets instead and save my museum time for Paris and Amsterdam, but for those who love history, Berlin has a wealth of options on Museum Island. Check it out here. While I have not personally been to the museum connected to the memorial, this important part of history recognizes and immortalizes the atrocities that took place here, in an effort to never forget the past while working towards a more peaceful future. I think this is one of the coolest and most unique things to do while in Berlin. The old American spy base, now named Devils mountain, has been covered in art by some of the most prominent street artists around. The old listening domes create a unique aesthetic and it is also one of the best spots in the city to get an awesome view. The only way to see it is to take a tour. More on that here. This urban space is one of my favorites to bring friends to because I love how the street is always changing, plus there is a rock wall, the largest indoor half pipe in Europe, a kung fu gym, and lots of places to see live music. There is also a flea market here on Sundays – that’s where I bought all of the furniture in my apartment too! One of the most historic Beer Gardens in Berlin’s Prenzauer berg district. It’s no secret that most young people come to Berlin because they have heard of the amazing nightlife scene. The party literally never stops. It’s totally normal to wake up at 6 AM on a Sunday morning and head straight to a nightclub and dance all day, or to enter on a Friday and walk out on a Sunday morning. Many of them have food inside so that you really don’t have to leave. Most of them, intentionally, will cover up your cell phone cameras so that you can’t take pictures while inside, and I also don’t want to spoil the fun or the surprise. This you’ve got to see for yourself! If you are the party type, chances are you have heard of this club. It is notoriously the most difficult club to get into in Europe. It got its start as a gay nightclub and is known for its techno beats. The line is often hours long, especially in the summer. I have been several times, and my secret is just to wear all black, don’t act too eager, and to go with someone who tends to get in often. They like familiar faces. If you don’t know anyone local, your best bet is dressing very casually, again in all black, and showing up alone. They tend to love it when people go solo. If you go in a big group, wearing heels, or wearing anything but black, chances are high that you will get turned away. For more LGBTQI-oriented nightlife options check out the Nomadic Boys’ Berlin Gay Area guide. I am not a big techno fan, which makes many locals gasp in horror, but luckily there are always options! so I tend to peruse Songkick for tickets for shows that I want to see instead of just going out and trying my luck at nightclubs. When it is warm enough, you will notice that there are chairs and tables set up outside of the small convenience stores known as spätis. It’s kind of like chilling at a small bar on the sidewalk, though they usually do not have bathrooms. However it can be a very social way to pass the time and it is not something I have seen elsewhere. Since we are talking about nightlife, I can’t skip this institution of Berlin. KitKat is a place where people are as naked and sexually free as they please. There is a dress code – one should be wearing latex or nothing at all. If you are open minded and adventurous, KitKat can be a fun club to check out. There is even a swimming pool inside! Berlin is known for two famous cheap eats: Currywurst and Döner kebab. Both meals are just a few euros and can be found on nearly every street all throughout the city. For the best ones, plus a few bonus cheap eats, check out this post on Berlin’s best street food. Since Berlin is such an international city, you can find food from all over the world here and much of it is authentic and delicious. Best of all, food in Berlin is usually a great value for the amount of food that you get as compared to much of the rest of Europe, so eat up! This restaurant has an ever-changing menu of flavorful Jamaican fusion cuisine. The combos are delicious and every time you go in there, you’ll discover something new on the menu. Bonus points since the owner regularly makes the trip over to London so that he can get access to fresh ingredients. While you would be much better off getting delicious Indian food in the UK than in Berlin, there is a pretty good restaurant that serves up delicious Sri Lankan food, which has itsf similarities to Indian cuisine but has a lot of its own flavors and dishes as well. Their menu also goes into detail about each spice and how it complements the meal. This restaurant serves up food that reminded me of what I found in Nepal. For those who are looking for a taste of the Himalayas with warm dumplings (mo mos), delicious dhal soups, and a noodle soup called thukpa, this restaurant will make you feel like you’re high up in the mountains. This place is pretty small, so it’s not great for a relaxed meal out, but if you’re dying for fried chicken or bibimbap, angry chicken has flavorful and delicious fried food for cheap. I’ve searched high and low and this tavern has the best and most affordable schnitzel in town. It’s also served up with a little bit of Spätzle, a soft egg noodle, and potato salad, Swabian style from Germany’s south. It’s not a fancy place but it’s cozy and friendly. Note that they open at 4pm. This used to be my absolute favorite Vietnamese restaurant for its authenticity. Recently the restaurant went vegan, and while I still feel they’re working their new menu out, it’s still a good spot if you have a craving for Vietnamese food without the animal products. It’s a little hidden so be sure to go through the courtyard to find it. *By the way, if you’re vegan and looking for more options, check out this Berlin vegan brunch post with lots of good options! Every time someone visits me, I bring them to this Lebanese joint where you can get a teller plate large enough to serve three people for only €11. It’s a stone’s throw from Klunkerkranich and I highly recommend combining the two! This place is a recent discovery of mine and like Al Andalos, their teller plate is affordable and full of varied and delicious flavors incorporating flavorful spices, sauces, yogurts, and veggies. This coffee and cake shop is known for having the best cheesecake in Berlin and after sampling it myself five times I can verify that it is delicious but the next spot gives it a run for its money. This little unassuming bakery has the best cheesecake I’ve ever had in my life. And it’s vegan! I don’t know how they do it, but it’s mouthwateringly delicious, as are their other cakes and coffee. This classy and quiet neighborhood in the west of the city is close to the main shopping street, Kurfürstendamm, Teufelsberg, and Thai park. It’s the first neighborhood I ever lived in and well, it is not my favorite, but it has a lot of higher and hotels and nice places to stay in. Similar to Charlottenburg, this neighborhood is quiet though it has a few more speakeasy-type bars and nice restaurants. While it is known as the gay area, the whole city is open, accepting, and free. I personally find it quite boring. This is my favorite neighborhood in Berlin and where I currently make my home. It is a Street Art mecca as well as a melting pot of cultures. It is also one of the grittiest parts of the city with lots of bars, cheap food, and awesome things to do. Mitte literally means center. This is the most central and also one of the most touristy places to stay in the city. It is close to the famous checkpoint Charlie, Brandenburg gate, and Museum Island. Parts of Mitte are very corporate, like Walstraße (Wall street) and others are a bit more funky and interesting, like the area near Mauer Park. While thanks to its central location this might be a good place to stay while visiting, this is the only neighborhood I have not lived in, by choice. I find it lacks character. This is my second favorite neighborhood in the city. Located in the former east, it’s where you will find the east side gallery, most of the night clubs, lots of great food, and a ton of other tourists. I love it for the world of things to do and the culture, but watch out for your belongings here! This up-and-coming neighborhood is a mix of hipsters and rougher areas where cat calling is common. I lived there for a summer and for that reason absolutely hated it, but I do like to go back for Klunker Kranisch and the delicious Turkish food and vegan cake. Also located in the former east, parts of this neighborhood have trendy restaurants and bars and other parts are much more family oriented. This is a nice, upscale neighborhood that has gentrified dramatically from its days under Soviet rule. It’s not my favorite nor least favorite neighborhood. This neighborhood is a bit rough around the edges. However several artists have studios here because the rent is cheap. It’s pretty far from most things a tourist would want to do, so I don’t see much point in staying here unless you want to be very close to Tegel airport. After almost four years and lots of research, this is the best of Berlin from an (almost) local’s point of view. The coolest thing about Berlin is, it’s always changing, and whether you’re here in the popular summer months or the cooler and darker winter, there’s a lot to discover and enjoy here. This post is always being updated with new discoveries, and I’m open to what you find as well, so please leave a comment if you’ve got some favorites here that didn’t make the list! Wow this is such an awesome and useful post! 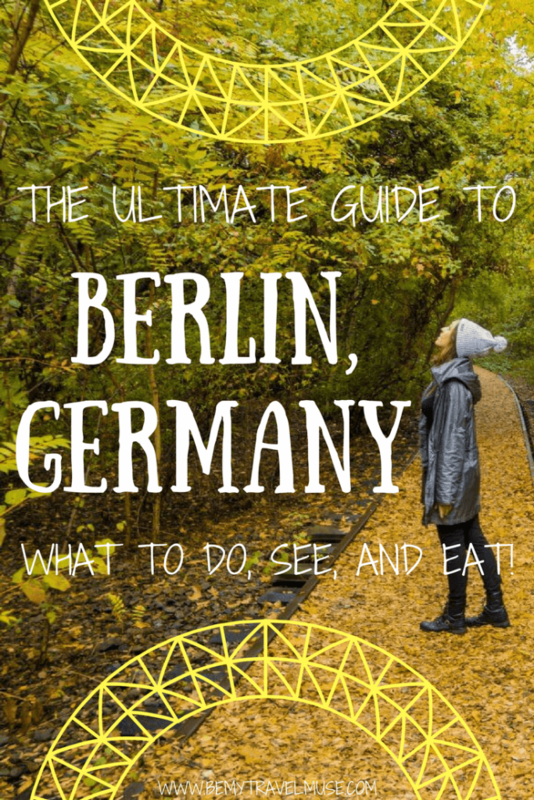 When I finally-one-day-I-swear make a journey to Berlin I will totally use this guide and try to experience everything possible. I wouldn’t want to go in without some sort of plan because theres so much there and I don’t want to miss something really cool! Thanks Kristen for this. Exactly what I need to tell my friend in Germany about the ins and outs of Berlin and if I ever want to visit. Thanks so much for providing the positives and negatives of the city, really great. You explore everything with such an open spirit, whether a city of in the most remote areas in Alaska, it is wonderful to see and so honest! I will be printing this out. The best review of a city I have seen. Also, awesome info for a vegetarian like myself, can see I would have it easy over there!! I don’t know how it works in Germany, but if you want to keep the Thai market, maybe the people can sign a petition or “write their representative” or “go to city hall” and push for a compromise. Unfortunately, if it actually attains full legitimacy it will probably become a tourist trap. I noticed from the comments on your link to it that they don’t want it to be too much on the radar. I think it is important that there is a level of hygiene maintained, I don’t know about Germany, but the place has lasted this long without any issues (so probably hygiene is fine! ), but liability exposure is still there which could shut it down. My only suggestion to you would be to see the Holocaust Museum in Berlin if you haven’t (versus the park). It is one thing to see a Holocaust Museum in the United States or anywhere else for that matter (I know it is everywhere), or even Yad Vashem in Israel, but to see how Germans illustrate it would be very insightful. It is a painful experience, but poignant here (the Nazis wanted a museum of the extinct Jewish race, instead they are extinct (well, hopefully) and provide a valuable lesson for all humankind). However, look what Berlin (and Germany for that matter) has become, so progressive and open, it is sweet justice, lovely and heartening. My grandfather would have been happy to see this (this is how it should have always been) and wouldn’t have believed it had come out this way so quickly. Not to be a hypocrite, I meant to say “whether a city or in the most remote areas in Alaska” not “of” and I left a stray parenthesis after “humankind” before “However”. The Spati culture immediately reminded me of South Korea! Every convenience store has little plastic tables outside and you will sit and drink soju for hours. And the only bathrooms are public ones inside the nearest building you can find. We used to always say the best bar in Korea was the GS Mart (or the 7-11, or the 이십사시). Definitely a super local (and super cheap) way to drink 🙂 Too bad I’m coming to Germany in December, I don’t think it will be warm enough for Spati! Nah definitely not so much of the Spati life going on in December but what you lose in Spatis you gain in Christmas markets! Mulled wine galore! My wife and I couchsurfed with an awesome guy in East Berlin this summer (we are a couple of 60 something backpackers from Montreal). We were both blown away by the vibe in Berlin. I admit, it was never really on our radar but it fit into our road trip. Berlin has now risen to one of the top places to spend more time in when we retire in a couple of years. I have been reading your great blog for a couple of years now and must say it has been a great source of info. Thank you so much for the kind words, Alan! Glad that you got a chance to come experience Berlin. It wasn’t on my radar at all until I came to visit a friend, so I understand. I could see someone from Montreal, based on what I’ve heard about it, liking Berlin too. Agree, there is a great deal of similarity between the two cities. Very multi ethnic, with a fabulous arts and cultural and foodie scene. One of Anthony Bourdain’s favourite cities. Come and visit us some time, I think you will be impressed with the city which has one foot in Europe (French speaking) and one foot in North America. Have you been to KitKat? It sounds wild! It is wild! That park sounds awesome! I’ve been to Berlin but I need to go back and do some of the things suggested! Like Vabali! I love experiencing spa cultures in different countries! And I heard Germany has some great ones! Yes absolutely and I really like this one in particular. It’s classy and the saunas are really hot! Thank you! This post was so helpful. My friend and I are taking a trip to Berlin in February. This will be the first time out of the country and you help put some of those fears to sleep. It’s fantastic! Have a blast. A very comprehensive guide to the City – many thanks for sharing. I’ve been planning on revisiting Berlin for quite a few years now. For some reason there is always another place to see first just because I have been to Berlin before. This article however reminds me that my previous visit was decades ago, and I will need to find time to return. Thank for the reminder and all the great tips! It’s changed so much! I would have loved to see it a few decades ago…wow.